After sunset I was walking around the caldera basin and just observed how the light changed. 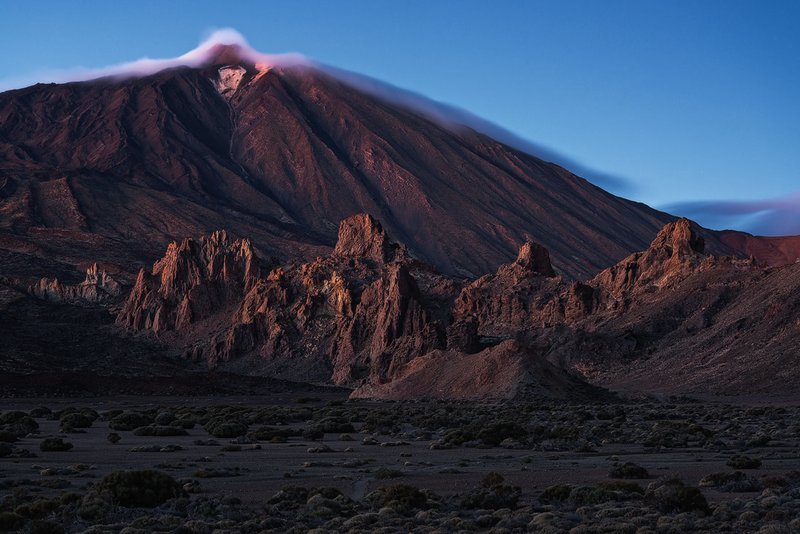 I noticed a change in the hues about 45min after sunset and also the clouds were rolling in behind the Teide. So I hiked back up in oder to get a better overview over the basin by that time the top of the volcano was already coverd by a layer of clouds which locals call the somrero. (Mostly the use that phrase when heavy lenticulares clouds are covering the top) What a surreal experience it was to witness the blue hour amidst the caldera of the volcano. The last remnants of light increased to reddish colour of the rocks and produced an amazing scene. Granted this is probably the most classic scene and compositionally nothing new, but for me personally it was still worth it. Now I do have my own version of this popular spot and I would argue that blue hour images are not that overrepresent.